FirstVitals is a healthcare service organization dedicated to the improvement of quality of healthcare for health plans, healthcare providers, and their members. healthier lifestyles through innovative technology. Our commitment is to personalize healthcare services with a focus on each individual's needs to enable us to promote quality care for healthier lifestyles through innovative technology. 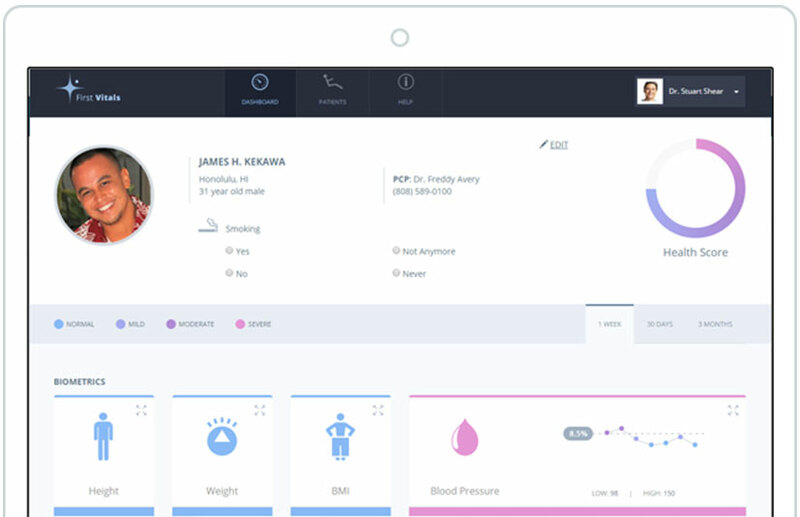 FirstVitals' Carepanion® System provides a telehealth chronic care management platform connecting healthcare providers and patients on a real time basis for improved monitoring, engagement and self-management. FirstVitals Carepanion® System provides a telehealth chronic care management platform connecting healthcare providers and patients on a real time basis for improved monitoring, engagement and self-management. FirstVitals provides diabetic complications assessment services for Medicare Advantage members without recognized diabetic complications to identify evidence of 1) Diabetic Retinopathy using a portable non-mydriatic fundus camera, 2) Diabetic Peripheral Neuropathy using a simple and quantitative nerve conduction testing device, 3) Lab Assessment for Microalbumin and eGFR to identify and stage members with Chronic Kidney Disease (CKD), and 4) Identification of Peripheral Arterial Disease (PAD) through an ABI exam. Assessment #1: Diabetic Retinopathy: Assess members with diabetes for diabetic retinopathy with a non-mydriatic fundus camera. Provide members with diabetes the annual retinal assessment to meet HEDIS quality improvement measures. Provide both technical and professional interpretation and recommendation to the member's primary care provider (PCP) for any follow up care. Assessment #2: Diabetic Peripheral Neuropathy: Assess members with diabetes for peripheral diabetic neuropathy through a non-invasive rapid sural nerve conduction device (DPNCheck). Refer members at high risk for foot ulcers for follow up care with either their primary care physician or podiatrist for preventive early interventions. Assessment #3: Diabetic Nephropathy: Assess members with diabetes for diabetic nephropathy via a microalbuminuria test, albumin-to-creatinine ratio test (also known as the ACR test) or the urine albumin test. In addition, an estimated Glomerular Filtration Rate (eGFR) to assess renal function will also be obtained. Identify members with CKD to preserve filtration, monitor CKD progression and to facilitate patient-clinician communication. Assessment #4: Peripheral Arterial Disease (PAD): Research shows that patients with Peripheral Arterial Disease (PAD) are four times more likely than the general population for risk of heart attack. Assess members to determine Ankle Brachial Index (ABI) and Pulse Volume Recording (PVR) with a non-invasive FDA cleared device. Identify members with cardiovascular disease with evidence of peripheral arterial disease for follow up care. Primary care providers need to know as much as they can about their patients, especially those with diabetes. Monitoring patients with diabetes to slow disease progression, adhering to medication prescription regimen, monitoring laboratory tests that needs to be updated, facilitating necessary follow-up assessments, and achieving thorough diagnosis code documentation are but a few of the challenges facing primary care providers. FirstVitals's end-to-end quality improvement services bring together advanced analytics, medical record retrieval, and abstraction capabilities to enable healthcare organizations improve HEDIS, STAR, and ACO measures. FirstVitals integrates quality and risk adjustment to deliver cost-effective and operationally efficient outcomes. FirstVitals's expertise in both member and provider engagement enables it to deliver a healthy measure-level, population-level, and program-level ROI. Business intelligence that drives a healthier population. What if you could know the health of your company at a glance? Our comprehensive approach to data management, analysis and reporting delivers vital insights to your company, including a view into the factors affecting overall health. This information helps shape the direction of employee health behavior and helps you gauge the return on your health and wellness investment. Our comprehensive business intelligence delivers vital insights to improve the effectiveness of your wellness program. Tracks and monitors a patient's weight. Tracks and monitors arterial pressure. Calculates the amount of oxygen is carried in the patient's blood. Monitors a patient's breathing capabilities. Tracks and monitors the amount of glucose in the blood. Measures the blood's anti-coagulation level. USB connected high resolution exam camera can be used for examining wounds during a live video conference. We include an Internet enabled tablet to provide real-time interaction between patients and carers including medical device monitoring; patient assessment questionnaires; messaging and reminders; video education and conferencing. Health and Wellness Inc 2014-15.